1999-12-21 Application filed by Computer Associates Think, Inc. filed Critical Computer Associates Think, Inc.
A job scheduling device providing a consistent set of application programming interfaces (APIs) (240) compiled and linked into an individual or suite of programs to provide scheduling services on a single computer or across multiple computing platforms, includes a GUI API for retrieving and validated job parameters, a job scheduling API for allocating jobs based on the job parameters, and an enterprise scheduling agent hosted on one or more nodes of the computer platforms. An enterprise communication agent sends messages (200) containing jobs from a computer executing a program utilizing the job scheduling device to the enterprise scheduling agent on a selected node where the job is to execute. Then, the enterprise scheduling agent retrieves job parameters and launches the job on the selected node. The enterprise scheduling agent maintains a local job repository (180) containing job information for each job run on its corresponding node and sends messages to a job data management API (230) to maintain a central job repository (190) containing information on jobs executed on all nodes. Field of the Invention This invention relates to the scheduling and monitoring of computer processes. The invention is more particularly related to the submission of jobs for execution. The invention is still further related to the submission, scheduling and monitoring of jobs across multiple networked computer platforms (nodes) and the provision of a common interface for programs submitting to the jobs. The invention is still further related to a job scheduler that maintains local job repositories having detailed job histories for each node and a central job repository maintaining detailed job history across an enterprise. The invention is yet further related to the provision of a scheduling agent on each computer platform to start execution of each job submitted. Modern computer systems are utilized for a wide range of tasks. Many tasks are simple and are executed in real time. However, some tasks require long execution times, or must be performed at various intervals or at inconvenient times (when a system where a task is running has a light tasking load, early morning or weekend hours, for example) . Basic scheduling devices have been utilized to run certain programs or jobs at various intervals or at specified run times. However, these systems do not provide adequate service or integrate seamlessly into any specific product line, nor provide appropriate service between multiple computing platforms in a networked environment. Accordingly, it is an object of this invention to provide a job scheduling apparatus for scheduling jobs. It is yet another object of the present invention to provide a scheduling agent on each respective node of a computer network for accepting and managing jobs submitted to the respective node; It is another object of this invention to provide a command line that may be utilized to determine job status and issue job control commands to jobs executing on a node in an enterprise. It is another object of this invention to provide a seamless job scheduling device for plural software products having a common format for submission and scheduling of jobs, and to provide consistent application programming interfaces to the software products utilizing the job scheduling device. It is yet another object of this invention to provide a single job scheduling and administrative tool for all POEMS enabled products (Platinum point products, for example) under a common application programming interface that specifically and efficiently targets job scheduling requirements of the products. Foundation Class (MFC) , for example) to schedule and list all jobs and common APIs used by a GUI component and the agent . Figure 63 is an illustration of a Director Service Manager Monitor; and Figure 64 is an illustration of a right side of a Service Manager Monitor displaying information for programs residing on a node. 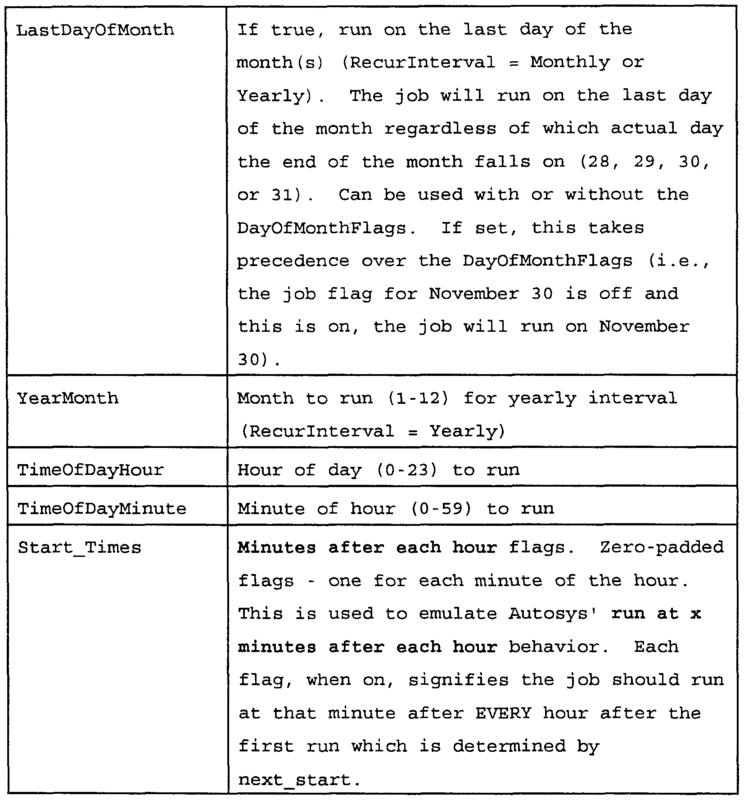 Referring now to the drawings, wherein like reference numerals designate identical or corresponding parts throughout the several views, and more particularly to Figure 1 thereof, there is illustrated an implementation of the present invention providing a job scheduling and administrative tool for POEMS enabled products (Platinum point products, for example) under a common application programming interface. In Fig. 1, a suite of point products 100 (point products 1..n) , each including a point product GUI 110, are linked together with various POEMS enabling application programming interfaces (API's), and a Platinum Enterprise Communicator (PEC) 160. At least one Lightweight Enterprise Scheduler (LES) agent 170 is installed on a node. The point product GUI 110 provides a user interface to the point product 100 and communicates user selections by sending job data to a GUI API 115. The GUI API 115 incorporates LES provided property pages, performs data checks and job allocation, and calls relevant scheduling functions in the job scheduling API 130 according to the job parameters. The GUI API 115 is used by the point product GUI 110. The job scheduling API 130 performs scheduling services, allocates and defines jobs submitted and distributes jobs by initiating a PEC message to an LES agent on a selected node to run the job (LES node 1, 170, for example) . Inter-process communications are performed via the PEC 160. The Job Scheduling API is preferably used by the point product GUI 110. The LES agent 170 initiates processing of the job as requested by the Job Scheduling API 130. The present invention may be implemented across multiple computing platforms and/or nodes, and an LES agent is installed on each node on which jobs run (LES agents 1..n) . Each LES Agent updates a local job repository 180 that maintains job information on each job submitted to it's respective node. The local job repositories are installed on each node where jobs run and may be implemented using SQL*Anywhere (a database product having a small footprint, for efficiency of resources) . Other SQL products and various database/repository configurations may be substituted. A central job repository 190 maintains a super set of job data on all jobs submitted to each node in the system. The central job repository is maintained by a job data management API 140, and is implemented in a Relational Database Management System (RDBMS) , Dex, or other data repository or management system. The job data management API 140 selects, inserts, updates, or deletes jobs and job histories. Both local and central job repositories are updated by job data management API. Also, the job data management API 140 is used internally by the job scheduler and the LES agent. The job scheduling API reformats data into PEC message format . (Software Delivery Manager) install prompts are utilized for table location information. Configuration files for set up of the POEMS environment, PEC 160, LES agents, etc. are maintained on a same node as the central job repository, each client machine, and on each node where jobs run. Each of the Central and local job repositories are automatically updated by LES. The point products themselves only interact with the API ' s and are not concerned with the details of either type of repository. A point product API 120 is provided to allow access by each point product to determine job status, job logfile, perform setup and cancel functions (jobs) , update the job logfile, and retrieve job parameters as the job runs. In the POEMS configuration, this API is utilized by the point product executable (point product 100, for example) . 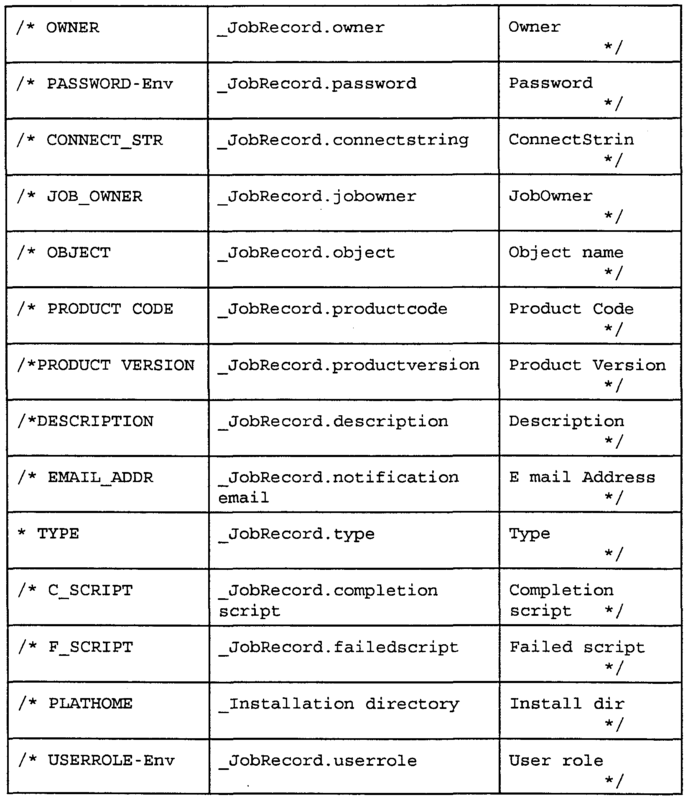 An LES command line 155 provides command line access to job administration functions (by communicating with a job administration API 150) , including determine job status, and setup, cancel, or update a job logfile and retrieve job parameters. The job administration API 150 deletes, cancels, reruns, or copies existing jobs. This API is used internally by the LES command line 155 and a job folder 185 (containing a list of jobs, that may be viewed in various formats) . Each of the point product API 120, Job Scheduling API 130, Job Data Management API 140, and Job Administration API 150, communicate as needed with any of LES agents installed on nodes 1..n via PEC messages. The PEC messages are provided in a format to communicate between LES enabled workstations and the various APIs . A calendaring API 165 is provided to manage calendar functions and is used internally by other API ' s and the point product GUI . 1. Enter job parameters in the point product GUI. 2. Press the "Finish/OK" button. 3. Job parameters are passed to the LES Job Distributor. 4. Parent job entry is placed in the central repository. 5. Job parameters are passed to the LES agent using PEC. 6. Job parameters are stored in the local Job Table. (If this step fails, an event/alarm is sent indicating that the job is not scheduled on the node.) 7. Child job is created and stored in the central repository. 8. Repeat steps 5-7 for each of selected nodes. (which launches the point product executable) . 10. 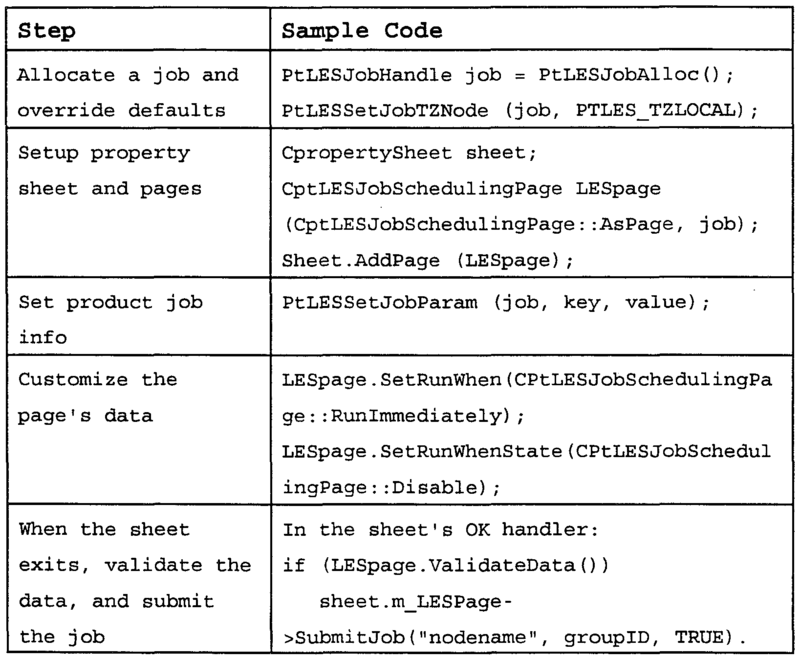 Job parameters are obtained from the job table using a LES API. 11. A job progress message is sent out. 12. The job's progress displays on the console using a progress monitor. 13. The job completes, and the LES agent places a record in the local Job History Table. 14. The LES agent places a record in the central Job History Table. 15. The LES Agent sends a "Job Complete" event. PEC messages from the Job Distribution API to the point product and from the point product to the Job Distribution API. 2. Job Management Module 220 - The LES kernel. This part of the agent sets up the internal environment and memory, launches the job, runs the job, and manages job processes. 3. Data Management Module 230 - Updates and deletes data from the Local and Central Repositories (180 and 190, respectively) . A low-level function API 240 is available to all agent modules. This low-level API handles all internal functions, file management, and messages. Figure 3 is a flow diagram illustrating how PEC messages are normally routed. A send module 300 sends a message 320 having a destination encoded therein which is received by an RT server which sends copies of the message 320a and 320b to each of Receive modules 340a and 340b, respectively (LES agents, for example) . To prevent the RT server from delivering the same job message to more than one agent, the LES agent registers as PTLES_<nodeaddress> datagroup. This registration identifies each LES agent with a unique datagroup so that messages may be routed to nodes of a datagroup corresponding to the message. Each LES Agent subscribes to the current node address (hostname) messages, so each sender should also specify which node will receive the message. Proper message routing is illustrated in Figure 4, which illustrates the RT server 310 passing the message 320 to Receivel module 345a, and Receive module 345b not receiving a copy. An RT Server runs on each machine where processes are managed, provides PEC routing to a correct destination. Figure 5 is a flow diagram illustrating the flow of messages incoming to an LES agent 500. All incoming messages are received via a PEC communication API (PEC 160, for example, see Figure 1), from any of a client process 520, point product agent 530, or other module communicating with an LES agent. Each message is routed via an RT server (510a, 510b, for example) to the LES agent 500. Figure 6 illustrates reverse message traffic, from the LES agent 500 to the point product agent 530. The LES agent 500 sends point product parameters to the point product process (agent) 530 using PEC messages via the RT server 510. Figure 7A is a flow chart illustrating the steps for LES agent startup. At step 705, LES configuration files (which maintain startup information on location of repositories, information for LES to find out how to set-up and operate) are loaded. At step 710, LES local job repository tables are created (local job repository 1 180, see Fig. 1, for example) . Step 710 is bypassed if local job repositories are already present on the node which the LES agent is being started. At step 715, the local job repository is synchronized with the central job repository 190. For example, The synchronization process updates the central job repository to reflect each entry in the local job repository, this process assures that the central job repository maintains records for each job across the enterprise. At step 720, a history row is added for all expired jobs (both central and local) . Information on expired jobs is maintained for historical purposes. At step 725, PEC call back functions are initialized. The PEC callback functions provide the appropriate API interface allowing communication with the PEC 160. At step 730, a synchronization timeout is computed and setup. The synchronization timeout is utilized to control how long to wait to connect to the other repository. As illustrated in Figure 7B, once the LES agent is started, it begins performing receipt and startup of job processes selected to be run on the node on which the LES is installed. At step 750, the LES agent computes and performs setup of a next job to run, and then enters a wait loop 760, where the LES agent waits for one of a PEC message, Synchronization timeout, and a timeout on a next job to run. When the wait loop times out on a next job to run, step 770 is performed, which includes running the current job (next job that timedout) , updating a start status of the job, and creating a run history row (updating and creating actions are performed in both local and central repositories) . When the loop times out on a synchronization, a Central/Local synchronization program is executed (synchronizes Local with central, and central with local) . When the loop receives a PEC message, the LES agent performs the action contained in the PEC message, step 780. PEC messages received by the LES agent include messages to run a job, cancel a job, update job status, request job parameters (Job parameters are information that a product would need, user name, db name, set by point product and stored in the LES API in an area of the LES db where point products can use for whatever they want) . Upon completion of either the job timeout, synchronization timeout, or PEC message action (steps 770, 790, and 780, respectively), the LES agent computes and sets up a next job to run (repeating step 750), and re-enters the wait loop 760. When the POEMS Scheduling Service is utilized to add a job, the point product GUI 110 calls the Job Scheduling API 130 to submit the job. 1. Saves the job in the central repository. 2. Checks to see if the agent is present. 3. If the agent is running, sends a PEC message (including the job) to the agent. The Agent performs the following steps: 1. Receives the PEC message. 2. Saves the job in the local repository. 3. Checks when to run the job. 4. Launches the command line. The LES agent is maintained in an hierarchically organized directory structure, one example being illustrated in Figure 8. A top level directory $PLATHOME 800 contains all relevant directories containing files related to Platinum products (other products could alternatively be used) . A POEMS root directory, $ptroot 810 maintains all directories and files related to enabling POEMS. A cfgref 830 directory maintains a configuration file configuration files 195, for example. A shlib* 840 directory maintains all *.lib, and * . so files, which are shared libraries. A bin 850 directory separately maintains each of a ptles* files 852, *.dll 854, and *sql.dll 856 files. The ptles* files 852 include ptlesag, ptlestp, ptlestab, and other related files. The *.dll 854 maintains each of dynamic link libraries, and *sql. * 856 maintains LES queries for LES functions. A log 860 directory maintains a ptlesag.log 865 logfile (that includes a diagnostic log, info about runs, and errors) . In one embodiment, as illustrated in Figure 9, the Platinum Security Model requires that many applications/point products be run as a specific user in order to succeed. An AutoLogin API provides a way to run jobs as al6 specific operating system user without querying the user at run-time or hard- coding the UNIX user as part of the job. To take advantage of this feature, an application may utilize an PtLESSetJobCommand ( ) function and pass a username and role to LES. If the username and role are set to NULL, LES runs the job as the default platinum user (or other default user) . Otherwise LES tries to retrieve the userid and password by calling the AutoLogin API and passing the username and role as Requested User and Requested Role, the operating system as Resource Type, and the job instance name as Resource Instance. 2. Log in as "root". If already logged in, "rtlogout.exe" may be utilized before running Administrator AutoLogin. 3. The AutoLogin Administration window displays. 4. Right- click on the Agent's Requesting User folder to invoke a pop-up menu display. 6. The Add Entry window displays. 7. Enter login information in the fields. h) The Resource Type is set to OS. i) The Resource Instance is the same instance name that the point product passes to the job. If the Point Product . . .
•Uses AutoLogin and a valid user ID and a password are recorded in the Add Entry window, the LES agent passes the ID and password strings and access is granted. •Uses AutoLogin but no user information is recorded in the Add Entry window, the LES agent automatically checks for the UNIX user login. If the UNIX user is found, access is granted. •Uses AutoLogin and an invalid user ID and password are recorded in the Add Entry window, the LES agent defaults to PLATINUM (or other default) user. •Does not use AutoLogin, the LES agents defaults to the PLATINUM (or other default) user. - Delete a job with all its runs. - Cancel a job's run. - List all jobs by product code, status, and/or node. Note: The -a option is for all actions; the -j option is for all actions except List; the others are optional . Ptlescmd is the LES command line interface used to delete a job, cancel a job run, list jobs (all jobs, by product code, by status, and/or node) , and rerun a job immediately. 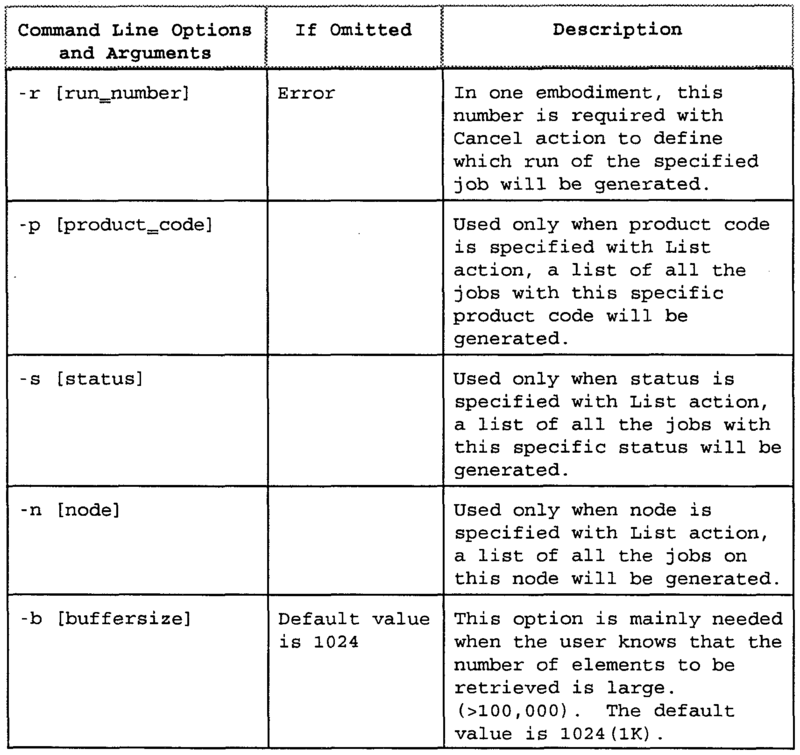 Table 1 provides a listing of the ptlescmd command line supported options. action is one of the following: delete, cancel, rerun, and list. jobid is the identifier used for the job. letter is the letter for one of the options listed in the Command Line Supported Options table. option_name is the name of one of the options listed in the Command Line Supported Options table. Table 2 provides a set of example command lines and a corresponding description. Note: Valid status values include: Completed, Failed, Notstarted, Preempted, Running and Stopped. LES jobs stay in the central and local repositories until the user deletes them. The user can delete, rerun, or cancel a running job at any time by right- clicking on the Poems director/Job folder 185 and selecting the appropriate option. A delete option removes the job and all the runs and history of the job. 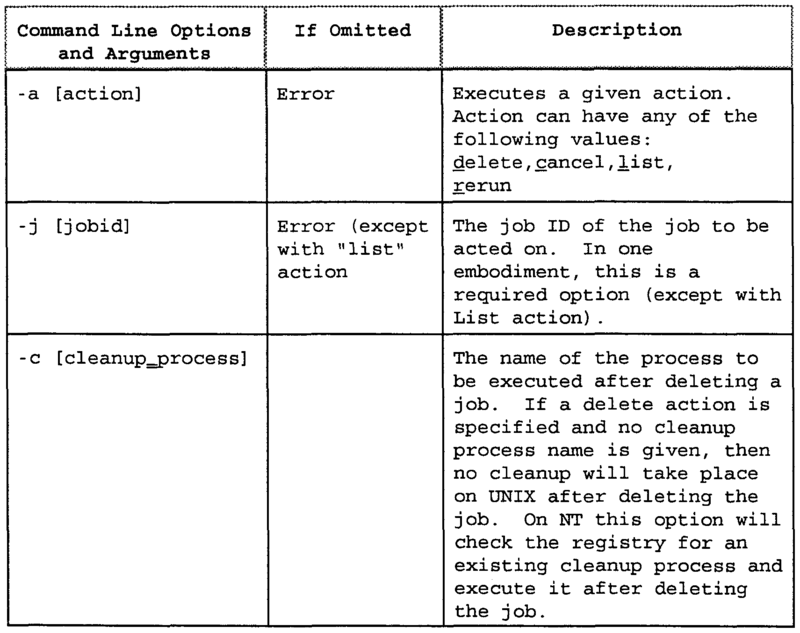 The point product may provide a cleanup process executable that removes all the point product files related to the job. This executable, if available, is run by the agent before removing the job and job history. Rerun Job and Update Job. The Rerun Job option allows a user to rerun the job with a different start time. A PtLESUpdateJo ( ) function allows updates for all GUI fields. Context variables, such as %C(PLATHOME) or the environment variable %E(FUS_H0ME) etc., which are resolved by the agent before running the job command. The UNIX username is set from the GUI point product as part of the job. The agent does not need the password because the agent is running as root (the agent has the set_root_ID bit) . Context Variables Context variables are keyword identifiers that may be used on the command line. The LES agent converts these variables according to the context of the current job and job parameters passed. The LES agent inserts these context variables, forms the command line, and then executes the command line. •Keyword Context Variable - Substitution takes place from the current job. •Environment Variable - Substitution takes place from the environment where the agent is running. Specified as %C( context identifier is replaced by value) -e.g., my_prog %C(JOB_ID) %C(USERNAME) replaced with my_prog 1234 manager where the current Job jobid = 1234 and username = manager. %E (HOME) %E (LANG) , my_prog/home/platinum en-us. Specified as %F (filename) - e.g., my_prog %F (/etc/platinum) %C(J0B_ID) %E (HOME)my_prog /home/dmc 1234 /home/platinum where the filename /etc/platinum contains the line /home/dmc. Acceptable %C(context variable name) syntax keywords: The syntax for the variables is %C (KEYWORD) . A user may insert a space on either side of the KEYWORD inside the parentheses. Table 3 provides a listing of sample keyword identifiers. •Allocate a job with the Job Scheduling API and override any default values as desired. •Base a GUI on class CptDynPropertySheet (which is derived from CpropertySheet) , instead of using CpropertySheet directly. CptDynPropertySheet is exported by DnyPS.DLL In addition, the GUI API may be used to submit a job without ever displaying the GUI window. (and any other pages) to the CptDynPropertySheet or CpropertySheet-derived property sheet. •Use the GUI API to customize any job parameters that are displayed on the scheduling property page. •Use the Job Scheduling API to set any required job parameters that cannot be set by controls on the scheduling property page. Examples of these include point product-specific job parameters set by calling PtLESSetJobParm. •When a final OK indicates that the job should be submitted, use the GUI API to validate the data and submit the job. Products that use the LES Job Scheduling page as a tab call its ValidateData () method before submitting the job. ValidateData () can be safely called multiple times and can be called in such a way that no message box appears to the user. The job distribution API dispatches information to appropriate machines (LES workstations) , typically called by the job data management API 140. The job scheduling API 130 works with the point product GUI to define submitted jobs. Some of the functions available via the job scheduling API are required, some are optional, and some are internal functions that can be set by the user through the LES GUI. A value is set for baseline functions and any desired optional functions or functions that are defined by the GUI (defined as appropriate for a corresponding point product) . The following tables list functions by type and provide a brief description of each function. The baseline functions are utilized to provide basic information for the job scheduling processes, and are listed with a description in Table 5. Table 7 lists internal functions that may be set by a user via the LES GUI. As discussed above, the job administration API 150 deletes, cancels, reruns, or copies existing jobs. In addition, it allows other APIs to determine job status, and setup, cancel, or update a job logfile and retrieve job parameters. For example, one process within the Job Administration API is the PtLESCancelJob utilized to stop currently running jobs. The PtLESCancelJob first performs a check on a specified node to see if the job is running, and issues a stop command to the corresponding LES agent if the job is executing. (ODBC) is used to select, insert, update, and/or delete each job or job history. The Point Product API allows the point product to communicate with the LES Agent. When you use this API, the LES job folder shows more accurate information about your job, the logfile viewer shows the job logfile, and the LES agent manages your point product job, making LES easier to use from a development standpoint. The functions of this API encapsulate PEC messages to the LES agent to update the job status or logfile, or signal the end of a running job process. The PEC model is adhered to wherein the LES agent and the point product are Rtclients using broadcast communication. PEC Initialization has been performed before calling any of the LES_API functions. In addition, the Point Product should call TptTerm before exiting. In one embodiment, SIGUSR2 is used as a CANCEL notification signal on all UNIX platforms, and the LES agent ignores this signal by default. Because the child process inherits all signals, the CANCEL event is ignored unless the point product takes action. As a result, conflicts may arise if a user application is using SIGUSR2 for other purposes (but allows for utiliation of standard UNIX toolsets for operations) . Table 10 provides example source code for a point product job template and may be considered an example use of the point product API 120. However, the code presented is not intended to be either a compilable or executable version of the present invention or a complete embodiment thereof, but merely an example representation of some of the features discussed herein. /* LES_API include files */ ttinclude "ptles_size.h" #include "ptles_ppapi.h"
/* for example purposes the num of keys allowed is limited to 10 */ #define MAX_KEYS 10 static char keys [MAX_KEYS] [KEY_L+1] -. fprintf (fplog, " - Point product example \n"); les_jobid = getenv ("LES_JOBID") ; les_groupid = geten ("LES_GROUPID") ; les_runtime = getenv("LES_RUNTIME") ; /* ** LES VI.1.0 New Env. The present invention has been implemented utilizing a GUI interface that includes either a window (POEMS Scheduling Service Job Scheduling Window, Figure 10 ) or a property page (Job Scheduling tab property page, Figure 11) . Other embodiments or arrangements of GUI windows or pages are also applicable , for example , using pull down selection menus instead of radio buttons , as just one example) . - Job run at a later time. - Starting time and date of the job. - Recurring run intervals for the job. - Create or select a scheduling calendar. In addition, the GUI interface allows a user define or modify a notification script. To start a job, a user enters a job description in the Job Description box, selects a run time as either immediate, a later time, or start date and time, and then Clicks on OK or Finish. POEMS has several features for providing the appropriate start date and time. For example, as shown in Figure 12 a pull down calendar is provided for date selection. The pull down calendar includes advance and decrease buttons as follows: 'Select the >> button to advance the year by one. •Select the << button to decrease the year by one. •Select the > button to advance to the next month. •Select the < button to move back to the previous month. Since the POEMS scheduling service schedules jobs at remote nodes, a selection box is provided to use the local time of the remote node as the starting time (instead of the submitting node) . •None - Used to schedule no recurring runs for the job. 'Minutes after each hour - Used to schedule recurring runs for a job each hour at a specified number of minutes after the hour. •Hours - Used to schedule recurring runs for a job at specified hourly intervals. 'Days - Used to schedule recurring runs for a job at intervals specified in days or every weekday. •Weeks - Used to schedule recurring runs for a job at intervals specified in weeks on the selected day or days . 'Months - Used to schedule recurring runs for a job at intervals specified in months on the selected day or days . 15 provides an example of a job scheduled to run every day (schedule the recurring run interval in days) . (schedule the recurring run interval in weeks) . (schedule the recurring run interval in years) . As discussed above, the GUI interface provides the user an opportunity to define, modify, or select a notification script. Notification scripts are shell scripts containing actions used to automatically provide notification about jobs and job status information. Other functions may also be performed by the notification scripts, for example. The point product application executes the jobs notification scripts. The product application documentation should include detailed information on actions taken upon job completion or job failure. Notification scripts may be constructed for tables, tablespaces, and indexes. When constructing a notification script for notification of a completed or failed job, variables of previously assigned values may be utilized. The values for these variables are the same ones defined for a particular job in the default notification script files. A user may define the values for the variables in these files, and then use the variables in the notification script as arguments. Using these variables in a notification script allows the same script to be utilized for various jobs, since different values may be assigned to the variables for each job. You can use variables in a job completion script or job failure script as determined by the product application. Table 11 provides a listing of established notification script variables, including a description of each variable. A Notification Scripts button on the GUI interface accesses a Notification Scripts window (see Figure 19) . The Notification Scripts window allows a user to: 'Modify the text to use for confirmation messages indicating the completion or failure of a job. •Write a customized script using the variables specified in this window. •Specify the path for the notification email address used to inform you of the job's completion or failure. In each of the Job completion script box and Job failure script box, a user may enter any of the predefined script variables to modify default script, or simply type in a full path location and filename for a notification script. Figure 21) . The user fills out the ID (a name for the calendar) and Description fields. •Select the >> button to advance the year by one. 'Select the << button to decrease the year by one. •Select the > button to advance to the next month. •Select the < button to move back to the previous month. By clicking a day of the month, a red border marks the date on the calendar and the complete date displays in the Selected dates field. Multiple days may be selected. then the user clicks on the day of the month. A red border marks the date on the calendar and the complete date displays in the Selected dates field. The above process is repeated until all the dates for running the job are displayed in the Selected dates field. The OK button saves the calendar and exits the window. The edited calendar is then available in the Calendar Selection window. Clicking the Cancel button exits the window without saving changes to the calendar. A calendar may be selected by clicking on the Select button of the GUI interface (Job Scheduling window/property page) , which displays the Calendar Selection window (Figure 20, for example) . A calendar is highlighted by clicking on the calendar ID or description in the Available Calendars list, and then clicking on the Select button (or double clicking on the ID or description) . The calendar selection window then closes and the selected calendar ID displays in the Calendar ID field on the Job Scheduling window or property page. A calendar my be deleted using the above procedure by clicking the Delete button instead of the Select button from the Calendar Selection window. Strategy Scheduling A Strategy Scheduling window is provided to view, create, modify, or delete schedules for a strategy. The schedule strategy window is invoked from a point product, as shown in Figure 23. Job Scheduling window/property page is then filled out for the new schedule. Job Scheduling window/property page available for editing a selected schedule. Delete Schedule window prompting for a clean up script is then displayed (see Figure 25, for example) . The user may either delete the schedule without running a cleanup script by deleting the text (if any) in the Name of a shell script or other process to run to clean up associated files field, or delete the schedule and run a cleanup script by typing a path and full name of the script. The user invokes the action by clicking OK or returning to the Strategy Scheduling window without deleting by clicking Cancel. (Figure 28), Representation (Figure 29), Subscription, Indicators, Job Repository (Figure 30) , and Event Correlation tabs. The Properties page includes a label and description field. The user enters a label and a description (description is optional) . The Representation tab allows the user to select, in an Intellicon View, an icon for representing the job, and optionally, a background and background color. Alternatively, the user may select an icon in Explorer view. The Intellicon view is show in Figure 29, and includes a list of Intellicon icons (provided by POEMS files, or alternatively provided by the user) , and a display window to view a selected icon (graphic) . An example of the Explorer view is illustrated in Figure 30, which is an Explorer view displaying Provision (point product, or application) Jobs (or LES jobs) as the label for a Jobs resource object. Selecting the Job repository tab displays a window for defining a timezone for display of times related to jobs. A down arrow pull down menu bar provides the user with selections of any timezone. This selection does not affect the time or timezone selected for running a job as specified in the Job Scheduling property page. In one embodiment, daylight savings time may be compensated for by providing an automatic compensation selector that invokes a program to adjust for daylight savings time; alternatively, the user may select a timezone just east of the desired timezone. 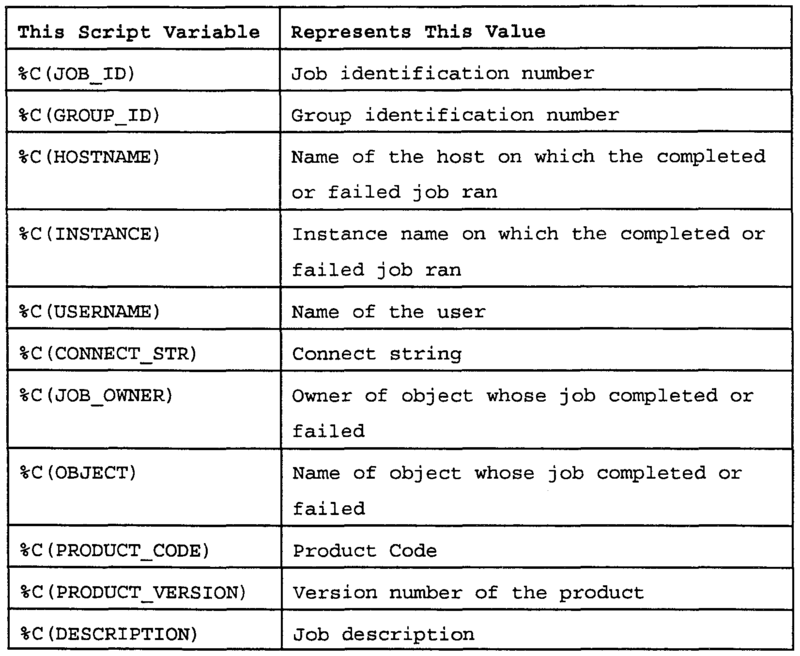 The Job Resource objects defined by the above processes enables a user to locate and view both jobs and runs. The user can locate each job in the Explorer view. Each time a job executes, it creates a new run, which then displays in a run folder for the job. Each Jobs resource object contains a hierarchy of folders sorted into the following categories: •All Jobs - Lists all jobs regardless of current status and also lists all runs by status. •Jobs By Group - Lists all jobs arranged by group Ids. 'Jobs By Node - Lists all jobs arranged by the node on which the job runs. •Jobs By Product - Lists all jobs arranged by the product used for the job. •Jobs By Type - Lists all jobs arranged by type. 'Jobs By User - Lists all jobs arranged by the user who scheduled the job. However, a point product may not allow a user to assign a job group or type. The hierarchy of folders is illustrated in Figure 32. The All Jobs Folder (see Figure 33) numerically lists all of the jobs instead of categorizing them by group, product or type. The All Jobs Folder lists jobs in folders, including: »A11 Jobs Any Status - Lists all jobs regardless of status along with associated job history (each run of the job) . •Stopped Runs •Held Jobs - Lists all of the jobs that are held and can be scheduled later. •Scheduled Jobs - Lists all of the jobs that are scheduled to run. A user can display jobs according to the groups assigned to them when they were originally scheduled by using the Jobs Group Folder. The specific product application (used to run the job) assigns a group, but may not use this classification. Jobs may be displayed according to the node on which they ran by using the Jobs By Node Folder. Jobs may be displayed according to the specific product that ran each job by using the Jobs By Product Folder. This is helpful if using multiple Provision products to schedule and run jobs with the POEMS Scheduling Service (helpful because it allows grouping of jobs by function or application, for example) . Jobs may be displayed by job type assigned to them when the jobs were originally scheduled by using the Jobs by Type Folder. The user's specific product application (used to run the job) assigns the job type. However, products do not necessarily use this classification. Jobs may be displayed according to the user who scheduled the job by using the Jobs By User Folder. Each of the Jobs By User, Jobs By Type, Jobs By Product, Jobs By Node and Jobs By Group Folders contain the same folder hierarchy for each user as that for the All Jobs Folder described above. Specific jobs may be located by expanding folders using the (+) signs in the Jobs resource object hierarchy. The resulting display includes Job ID, Job Icon, and a Job description. In addition, a (+) sign of a specific job reveals its run history (See Figure 35, for example) . The run history is stored in several folders. The All Runs folder contains every run regardless of its status. The remaining six folders contain only the runs that possess the status that applies to that folder (Completed, Failed, Not Started, Preempted, Running and Stopped Runs) . Figure 34. In Figure 34, Run #1 of Job 883 is stopped; therefore, it displays in the Stopped Runs folder as well as in the All Runs folder. •Group ID - Strategy group ID number. •Strategy ID - Strategy ID number of the strategy defined in the Common Strategy Services to which the group belongs. 'Description - Description of the group that the user can enter when the group is created. •Product Code - Code for the product used to create the jobs that can be viewed in this folder. •Product Version - Version number of the product used to create the jobs that can be viewed in this folder. The following data column displays when the user clicks on the text of the Jobs By Node folder in a Jobs resource object: Node - List of the nodes under which jobs are located. •Product Code - Code for the product used to create the jobs that can be viewed in this folder. •Product Version - Version number of the product used to create the jobs that can be viewed in this folder. •Type - List of job types. The user can locate jobs under their job type, which is assigned in the product used to run jobs. •Job ID - Unique Job ID number. •Description - Optional description of the job. •Job Group - Strategy group ID number for the group to which the job belongs. 'Access Mode - If this column displays L, the job is locked and you cannot rerun the job until the job is unlocked. A job is locked and unlocked by the point product running the job. If a job is not locked this column remains blank. 'Product - Product that created the job. •Type - Job type (product-dependent) . •Node - The machine on which the job will run. •Whosetz - Time zone to use for scheduling the job. •When Deployed - Time that the job is written into the job table. •The next time the job is set to run. »Run immediately. •Schedule later (held) . •Run Count - Total number of times the job was run. 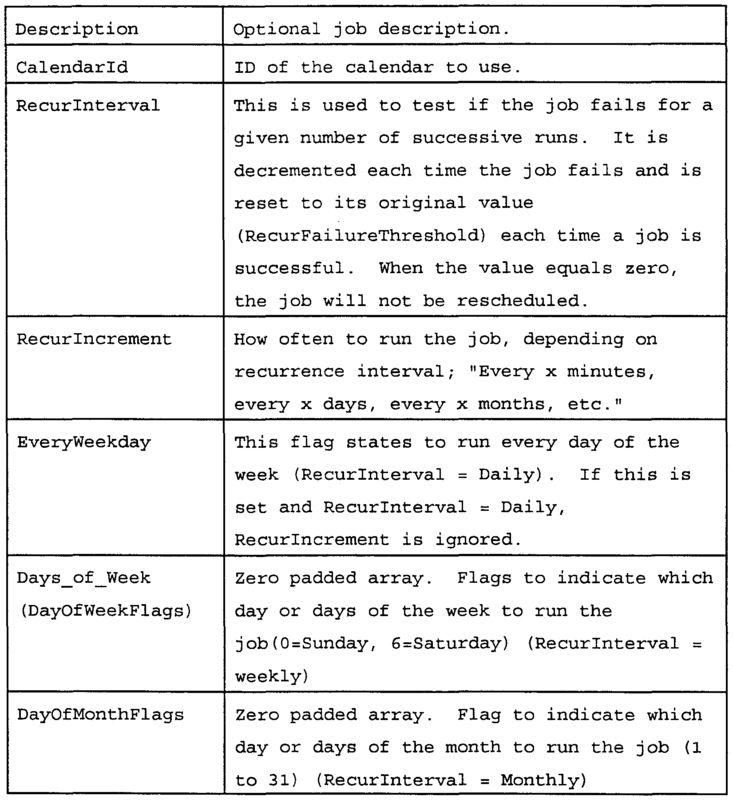 The following data columns display when the user clicks on the All Runs By Status folder and any folder containing runs : •Job ID - Unique Job ID number for this run. •Run Number - Unique run number (the number assigned to each recurring run of the job) . •Group ID - Strategy group ID number of the group where the job belongs. •Product - PLATINUM Provision product (or other product) that created the job. •Type - Job type (product-dependent) . •Time Zone - Time zone used for job runs. 'Scheduled Start Time - Time the job is scheduled to start. •Start Status - Status of how the job started. This status is set by the POEMS Scheduling Service and the column may contain the following values: »0: Job started successfully. (insufficient system resources) . •4: Invalid user. •Actual Start Time - Time when this job run actually started. »End Time - Date and time when the run completed. •OS Status - Provided by the operating system when job process could not be created (see your operating system documentation for information) . •Complt Status - Completion status of the run assigned by the point product that ran the job (see your product-specific documentation for information) . •Failed - This column may contain the following values : •0: Job was successful. •1: Job failed for any reason. •Preempted - This column may contain the following values: *1: Job did not run because it was disallowed due to your specific product's operating rules . •1: Job process finished without notifying the agent and the status is not known. •-1: Job was not stopped. •Logfile - Name and location of the logfile for this run. Data about specific objects (jobs, runs, groups, products, or types) may be viewed within a Jobs resource object. The data displays in a property page format with one or more tabs on the right side of the Director (Explorer view) window. Clicking on the text of the object displays the data in property page format on the right side of the Director, as illustrated in Figure 37, accessing the property page data. •Description - Optional description of the job. 'Group ID - Strategy group ID number of the group to which the job belongs. •Target Node - The machine where the job will run. •Deployed to Target Node - Time when the job is written into the job table on the node where it will run. •Job Type - Job type (product-dependent) . »Job Owner - Owner of the object on which the job is performed. •Run Count - Number of times the job was run. •Run State - This column may contain the following values: »0: Waiting for the next run. •0: the job will not be rerun. •Recur Fail Threshold - Number of failed product runs accepted before the rescheduling of the job is stopped. 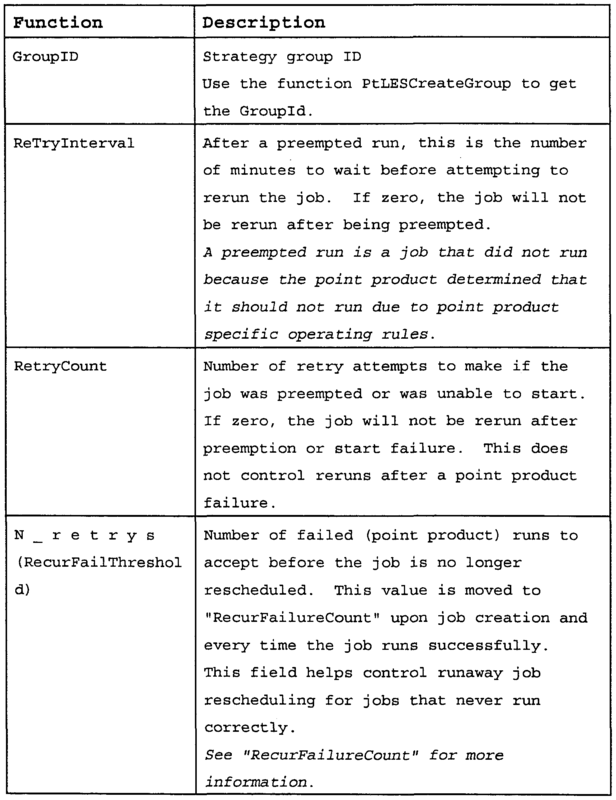 «Recur Fail Count - Used to test if the job has failed for a given number of successive runs. (The number is decreased with each failure and reset to the original value with each successful run; if it is 0, the job is not rescheduled.) •Access Mode - If Locked appears, the user cannot rerun the job until the job is unlocked. A job is locked and unlocked by the point product running the job. If a job is not locked, this field remains blank. Other Property pages are displayed by clicking on a corresponding tab. The Command property page (see Figure 38) contains the following fields: 'Command Line - Command line to execute. •E-Mail Completion Notification to - Email address used to send job completion or failure notification. •Completion Script - Job completion script. 'Failure Script - Job failed script. •Product Code - Code for the Provision product that created the job. •Database Connect String - Optional database connect string or name used. •Database Instance - Name of the instance on which the completed or failed job ran. 'Object Name - Name of object whose job completed or failed. •User ID - Database user ID. •User Password - Encrypted database user password. Note: The information on this property page is set by the point product that runs the job. The Job Scheduling property page (see Figure 40) displays the following job scheduling selections made in the product that ran the job: •Start date and time of the job. •Time zone where the job was scheduled. Note: If the Use time zone of this workstation button is selected, it refers to the workstation where the job was scheduled. •Interval at which the job reruns. •Calendar ID of stored calendar used to run the job. This field displays a Calendar ID only if a stored calendar was used. •Job ID - Unique Job ID number for this run. »Run Number - Unique run number (the number assigned to each recurring run of the job) . •Time Zone - Time zone where the job runs. •Scheduled Start Time - Time when the job is scheduled to start. 'Actual Start Time - Time when this run of the job actually started. •Start Status - Status of how the job started (set by the POEMS Scheduling Service) . •Started successfully. 'Expired - Job did not run because the start time passed while the POEMS Scheduling Service was down and the job was not recurring. •Agent down - The POEMS Scheduling Service agent is down. •Fork failed - Process could not run on agent machine due to insufficient system resources. *End Time - Date and time the run completed. •Operating System Status - Status of the process provided by the operating system. •Completed - The run is finished. •Not Started - The run has not started yet. •Running - The run is currently in progress . •Stopped - The process has finished without notifying the agent and the status is not known. •Preempted - The run was disallowed due to point product operating rules. •Failed - The run failed due to an unspecified reason. •Completion Status Code - Completion status of the run assigned by the point product that ran the job (see product- specific documentation for information) . 'Logfile - Name of the logfile for the job. •Click on the text of a group in a Jobs resource object, the General tab property page, as shown in Figure 44, is displayed. •Group ID - Strategy group ID number. •Description - Optional description of the group. 'Strategy ID - Strategy ID number of the strategy defined in the Common Services Strategy where the group belongs. •Product Code - code (three-letter Platinum code, in one embodiment) for the Provision product used to create the jobs that can be viewed in this folder. •Product Version - Version number of the Provision product used to create the jobs, which can be viewed in this folder. «Jobs Per Run - Number of POEMS Scheduling Service jobs submitted by the product for this strategy group. •When Created - Date and time the strategy group was generated. 46, for example). Finally, selecting View Log File from the popup menu brings up the display shown in Figure 47. When the user no longer requires a job history, it may be deleted using the Jobs Administrator window. Either multiple jobs or single jobs may be deleted. To delete multiple jobs, the Jobs Administrator window is accessed at the level of the folder that contains the jobs to delete in a Jobs resource object. Then, a right -click on the icon or text of the folder to display the popup menu illustrated in Figure 48. Selecting Delete from the popup menu displays the Delete Jobs window (see Figure 49) . This window displays the Job ID and node name of all of the jobs selected in the Submit Jobs/Runs field. Note: The Select All button may be used to reselect all the j obs . Clicking on the Submit button deletes the selected jobs. The window expands to provide a dynamic display of the status and results of the action (see Figure 50) . If the deletion of a job completes successfully, the job ID and node name for each job display in the Succeeded field. If the deletion of a job fails, the job ID, node name, and an error code for that job display in the Failed field. A running total of submitted, succeeded, pending and failed deletions displays in the small Submitted, Succeeded, Pending, and Failed fields. Alternatively, a user may click on the Close button while the jobs are deleted without waiting for all of the results to display in the expanded window; or wait until all of the results (successful or failed) display in the Succeeded or Failed fields in the expanded window. The Close button then changes to the Done button, which you select to close the Jobs Administrator window. 52) . This window shows the Job ID and node name of the selected job. If the user clicks on the job, it is deselected and the Submit button becomes inactive. Clicking the Submit button deletes the job, and the window expands to provide a dynamic display of the status and results of the action (see Figure 53) . Succeeded filed. If the deletion of the job fails, the job ID, node name, and an error code for the job display in the Failed field. Succeeded, Pending, and Failed fields. To rerun multiple jobs, the Jobs Administrator window is accessed at the level of the folder containing the jobs to rerun in a Jobs resource object. The folder containing the jobs to rerun is located, and a right- click on the icon or text of the folder displays a popup menu (see Figure 54) . Selecting Rerun from the popup menu displays the Rerun Jobs window (see Figure 55) . This window displays the Job ID and node name of all of the jobs selected in the Submit Jobs/Runs field and provides options for rerunning them. Similar to the Delete Jobs procedures discussed above, all of the jobs in a folder are initially selected. If the user clicks on a job, it is deselected and will not be rerun. If the user deselects all of the jobs, the Submit button becomes inactive. Or 'Clicking on the Schedule later button to cancel the previously scheduled next starting time for the jobs and hold the jobs in the Held Jobs folder. Note: Jobs may be rerun either immediately or at a specified time using the Job Administrator window (see Rerunning Multiple Jobs discussed above) . Or •Clicking on the Run at button and type the date in the Job Start Date field, or clicking on the down arrow to select the date from a calendar, then typing the time in the Job Start Time field, or using the up/down arrows to scroll to the desired time. Note: In one embodiment the user must set the date and time in these fields using the time zone originally used to run the jobs. The job times in the Jobs resource object may not display in the time zone where the job originally ran. The selected jobs are then rerun at the specified date and time. Clicking on the Submit button reruns the selected jobs, and the window expands to provide a dynamic display of the status and results of the action (see Figure 56) . To rerun single jobs, the Jobs Administrator window is accessed at the level of the job to rerun. After locating the job to rerun in the Jobs folder, the icon or text of the job is right-clicked to display a menu (see Figure 57) , and Rerun is selected, displaying the Rerun Jobs window (see Figure 58) . This window displays the Job ID and node name of the selected job and provides options for rerunning it. Clicking the job deselects it and the Submit button becomes inactive. Similar start date & time options, as discussed above, are also available. Clicking on the Submit button reruns the job. As with the other rerun options, the window expands to provide a dynamic display of the status and results of the submission. The user can use the Jobs Administrator to cancel a running job. The user can cancel multiple runs or single runs of a job. However, some products may temporarily disable this capability during a critical stage of a job, which does not allow recovery, makes recovery difficult, or requires that the product specific procedures be followed for recovery. To cancel multiple runs, the Jobs Administrator is accessed at the level of the folder containing the runs to cancel in a Jobs resource object. After locating a Running Runs folder containing the runs to cancel, a right-click on the icon or text of the folder displays a popup menu (see Figure 59) . By selecting Cancel from the popup menu, a Cancel Runs window is displayed (see Figure 60) . This window displays the Job ID, run number, and node name of all of the runs selected in the Submit Jobs/Runs field (see Fig. 57, for example) . Similar to the Delete Job procedures, all of the runs in a folder are selected initially. By clicking on a run, it is deselected and will not be canceled. If all of the runs are deselected, the Submit button becomes inactive, etc. The Submit button cancels the selected runs, and the window expands to provide a dynamic display of the status and results of the action. Monitoring the Progress of Jobs A Progress Monitor is provided to view information about a current phase and overall progress of any job run by products using the POEMS Scheduling Service. Individual products publish events regarding the different phases of their jobs. The Progress Monitor subscribes to these events and uses the resulting data to provide the user with information on the progress of the j ob . The Progress Monitor may be accessed at the individual run level in the Jobs Repository Resource Object. •Name of the current phase of the job. «Job ID and run number. •Name and/or number of the current phase of the job. •Current phase number and the time remaining in the current phase. 'Graphical display of the progress of the current phase of the job and the percentage completed of the current phase . •Graphical display of the overall progress of the job (including all phases) and the percentage completed for the entire job. In one embodiment, the contents of the main text field vary according to the design of the product that scheduled the job. The name of the current phase of the job can be viewed from the title bar of the Progress Monitor window. The progress of the job's current phase is determined by viewing the main text field in the Progress Monitor window, or viewing the Current Phase Progress field in the Progress Monitor window. Black bars are used to graphically display the phase progress. This field also provides the percentage completed of the job's current phase. The present invention includes a number of troubleshooting techniques. 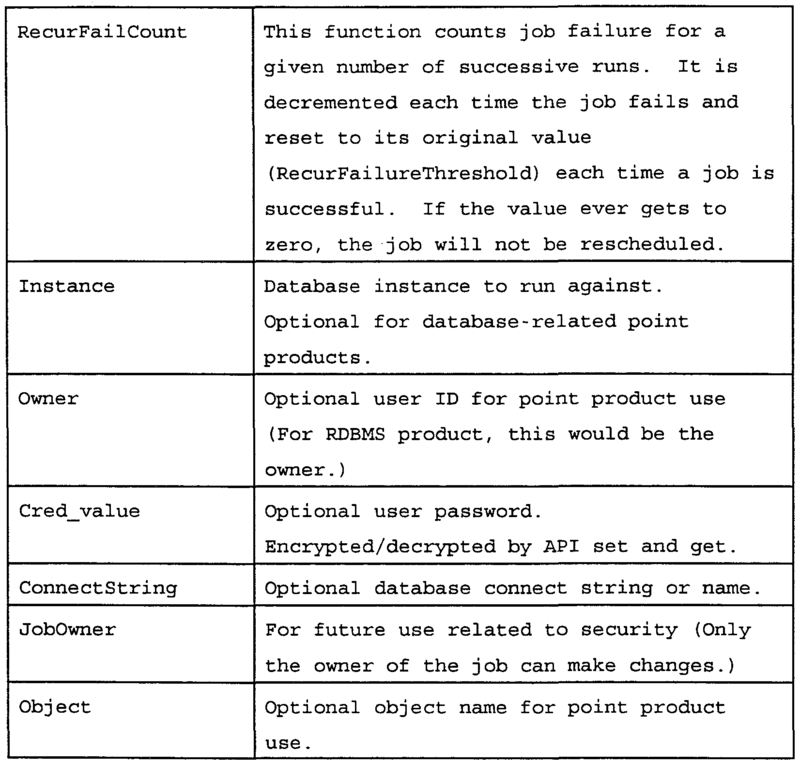 A number of possibilities may cause a failure to delete and rerun jobs, or cancel specific runs of a job. •Communications to the local and central repositories may not be working. Verify that you can communicate with both of the repositories, and then submit the request again. •The user may have attempted to cancel a run during a critical phase of job execution. The specific Provision product being used may prevent the user from using the cancel feature to avoid a potential conflict. •The POEMS Scheduling Service agent (ptlesag.exe) may not be running on the node/machine where the object is located. Verify that a scheduling service agent is running on that machine, and then submit the request again. To verify that a Scheduling Services agent is running on a node, a user selects Tools ► Monitor ► Service Managers from the menu bar to display the Director Service Manager Monitor window (see Figure 63) . The user may click on the plus sign (+) or double- click on the text of Service Managers to display the list of service managers on different nodes. Clicking on the text of the service manager for a node brings up the right side of the Service Manager Monitor with information for the programs residing on that node (see Figure 64) . The present invention has been described in reference to the POEMS Scheduling service utilized by the Platinum suite of database products. However, the teachings of the present invention may be applied to any individual or suite of computer or other products to provide similar services. Therefore, the present invention is not limited to a specific line of products or type of products (point products, Provision products, or databases, for example) and apply to any computer processes or applications in general. The present invention may be conveniently implemented using a conventional general purpose or a specialized digital computer or microprocessor programmed according to the teachings of the present disclosure, as will be apparent to those skilled in the computer art . Appropriate software coding can readily be prepared by skilled programmers based on the teachings of the present disclosure, as will be apparent to those skilled in the software art. The invention may also be implemented by the preparation of application specific integrated circuits or by interconnecting an appropriate network of conventional component circuits, as will be readily apparent to those skilled in the art. The present invention includes a computer program product which is a storage medium (media) having instructions stored thereon/in which can be used to program a computer to perform any of the processes of the present invention. The storage medium can include, but is not limited to, any type of disk including floppy disks, optical discs, DVD, CD-ROMs, microdrive, and magneto-optical disks, ROMs, RAMs, EPROMs, EEPROMs, DRAMs, VRAMs, flash memory devices, magnetic or optical cards, nanosysterns (including molecular memory ICs) , or any type of media or device suitable for storing instructions and/or data. Stored on any one of the computer readable medium (media) , the present invention includes software for controlling both the hardware of the general purpose/specialized computer or microprocessor, and for enabling the computer or microprocessor to interact with a human user or other mechanism utilizing the results of the present invention. Such software may include, but is not limited to, device drivers, operating systems, and user applications. Ultimately, such computer readable media further includes software for performing the present invention, as described above . Included in the programming (software) of the general/specialized computer or microprocessor are software modules for implementing the teachings of the present invention, including, but not limited to, application programming interfaces for Graphical User Interfaces, Job Scheduling, Job Data Management, Job Administration, a command line interface, calendaring functions, and communications across a network. The software modules also include job scheduling agents operating on individual nodes on computer platforms in the network, and modules for the display, storage, or communication of results according to the processes of the present invention. Each of the above-described APIs are compiled and linked into specific point products, Provision products, or other applications utilizing those APIs to perform the present invention. In addition, configuration files are maintained for setup and operation of the invention and repositories are maintained by the invention. 1. 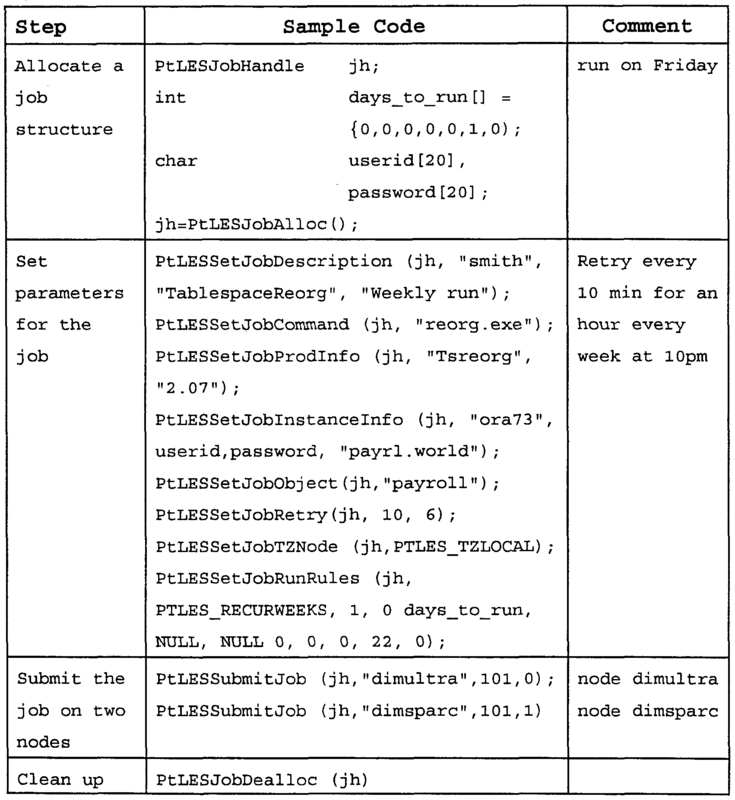 A job scheduling device for scheduling jobs to run on at least one node of at least one computing platform, comprising: an enterprise scheduling agent installed on each node and configured to launch execution of jobs submitted to the agent; a presentation layer configured to accept and validate parameters identifying at least one job to be submitted for execution on at least one of said nodes; and a job scheduler configured to allocate at least one job based on said parameters and submit the allocated jobs to at least one enterprise scheduling agent . 2. The job scheduling device according to Claim 1, further comprising: a job data management device configured to maintain job data and job histories of jobs submitted to each enterprise scheduling agent. 3. The job scheduling device according to Claim 2, wherein said job histories include information received from each enterprise scheduling agent regarding status of the jobs submitted. 4. The job scheduling device according to Claim 2, wherein said job data management device is utilized by said job scheduler to set parameters in jobs to be submitted to said enterprise scheduling agent . 5. The job scheduling device according to Claim 1, further comprising: a job history repository that saves both jobs and job histories of jobs submitted to each enterprise scheduling agent; wherein each enterprise scheduling agent comprises, an agent communicator configured to send and receive messages between said job scheduler and the enterprise scheduling agent, a job manager configured to setup, launch, run, and manage jobs submitted to the enterprise scheduling agent, a data manager configured to update and delete data from said job history repository, and a low level API configured handle internal functions of said enterprise scheduling agent (LES Agent) , file management, and message handling functions. 6. The job scheduling device according to Claim 5, further comprising: an enterprise communicator configured to construct and communicate messages between said job scheduler and each enterprise scheduling agent; and a job data management device configured to maintain job histories of jobs submitted to each enterprise scheduling agent; wherein said data manager updates said job history via enterprise communicator messages sent from the enterprise scheduler to said job data management device. 7. The job scheduling device according to Claim 1, further comprising: a command line device configured to accept commands regarding administration of jobs submitted to the enterprise scheduling agents; and a job administration device configured to communicate said command line to at least one of said enterprise scheduling agents for execution. Claim 7, wherein: said commands accepted by said command line device include at least one of delete a job and all runs of the job, cancel a job's run, list all jobs, list all jobs by at least one of product code, status, and node, and rerun a job immediately. 9. The job scheduling device according to Claim 8, wherein: said commands accepted by said command line device include context variables; and said enterprise scheduling agent converts said context variables according to a current job and job parameters, and executes said commands. 10. The job scheduling device according to Claim 1, further comprising: a point product device configured to provide a communication link between said enterprise scheduling agent and at least one product submitting jobs to said job scheduling device; wherein said point product device communicates job status, job logfile, setup, cancel, job parameter functions, and requests between each enterprise scheduling agent and said at least one product. 11. The job scheduling device according to Claim 10, further comprising: a job administration device configured to accept command line inputs and communicate said command line inputs to at least one enterprise scheduling agent; a job data management device configured to maintain job histories of jobs submitted to each enterprise scheduling agent; and an enterprise communicator configured to send messages between at least one of said job scheduler, point product device, job administration device, and job data management device and each of said enterprise scheduling agents. 12. The job scheduling device according to Claim 1, further comprising: an enterprise communicator configured to send messages between said job scheduler and each of said enterprise scheduling agents. 13. The job scheduling device according to Claim 12, wherein: each enterprise scheduling agent is registered at a specific node address that identifies each enterprise scheduling agent with a unique datagroup; and said enterprise communicator encodes each message with at least one destination corresponding to a datagroup to direct each message to at least one enterprise scheduling agent. 14. The job scheduling device according to Claim 1, further comprising: a local job repository installed on each of said nodes; wherein: each local job repository maintains job and job history information on each job submitted to the node where the local job repository is installed; each local job repository is updated by the enterprise scheduling agent installed on the node where the local job repository is installed; and said job information includes job parameters needed to execute each job. 15. The job scheduling device according to Claim 14, further comprising: a job data management device configured to maintain job histories of jobs submitted to each enterprise scheduling agent; and a synchronizing device configured to synchronize each local job repository with the job histories maintained by said job data management device. 16. The job scheduling device according to Claim 1, further comprising: a progress monitor configured to monitor and display execution of at least one of said jobs; wherein: said progress monitor provides a visual display of, an identification of said job and a current phase of said job, a percentage complete of said job, and a percentage complete of said current phase. 17. The job scheduling device according to Claim 1, further comprising: an autologin device configured to accept login parameters from a user submitting a job; wherein said login parameters are utilized by an enterprise scheduling agent to launch and execute the job submitted. 18. The job scheduling device according to Claim 1, further comprising: a notification scripting device configured to execute a notification script having instructions for notifying a user of status of a submitted job; wherein said notification scripting device includes facilities for creating, editing, and selecting a notification script for a specific job. 19. The job scheduling device according to Claim 1, wherein: said presentation layer includes, a GUI interface that accepts user inputs for scheduling and specifying a job to be submitted; wherein said GUI interface includes facilities for selection and creation of a scheduling calendar, selection of a start date and time, selection of recurring job run intervals, and selection of an immediate job run. 20. The job scheduling device according to Claim 1, further comprising: a resource management device configured to enable a user to locate and view jobs and job runs. 21. The job scheduling device according to Claim 20, wherein: said resource management device includes an RM GUI for defining an object representing a job, having, a general properties page having input fields for a label identifying the job, and a description of the job, a description properties page having a selection field for identifying an icon for representing the job, and a repository page having a selection field for identifying a time zone for display of job times. 22. The job scheduling device according to Claim 21, wherein: objects defined by said resource management device comprise, a hierarchy of folders including at least one of an all jobs folder, a jobs by group folder, a jobs by node folder, a jobs by product folder, a jobs by type folder, and a jobs by user folder. 23. 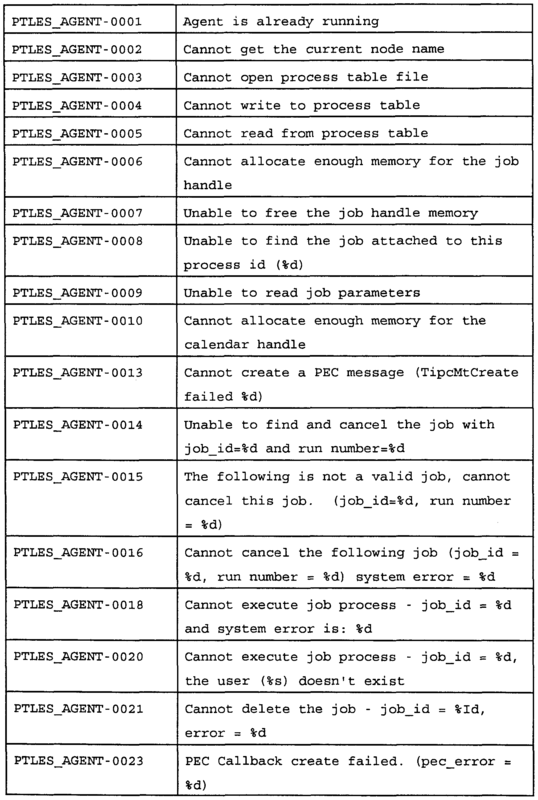 The job scheduling device according to Claim 22, wherein said all jobs folder includes folders, including, an all jobs any status folder listing jobs regardless of status and associated job history of each job, an all runs by status folder listing jobs according to status, including completed runs, failed runs, not started runs, preempted runs, running runs, and stopped runs, a held jobs folder listing jobs that are held and can be scheduled for a later time, and a scheduled jobs folder listing jobs that are scheduled to run. 24. The job scheduling device according to Claim 1, wherein: said presentation layer includes, a strategy scheduling window configured to allow a user to view, create, modify, and delete schedules for a strategy. 25. A method of scheduling jobs across multiple networked computing platforms, comprising the steps of: determining at least one job based on job parameters for at least one job to be scheduled; sending said at least one job to at least one scheduling agent maintained on a selected nodes of said computer platforms; and executing each job on the selected node under management of said scheduling agent. 26. The method according to Claim 25, further comprising the steps of: monitoring progress of the executing job; and displaying said progress on a progress monitor. 27. 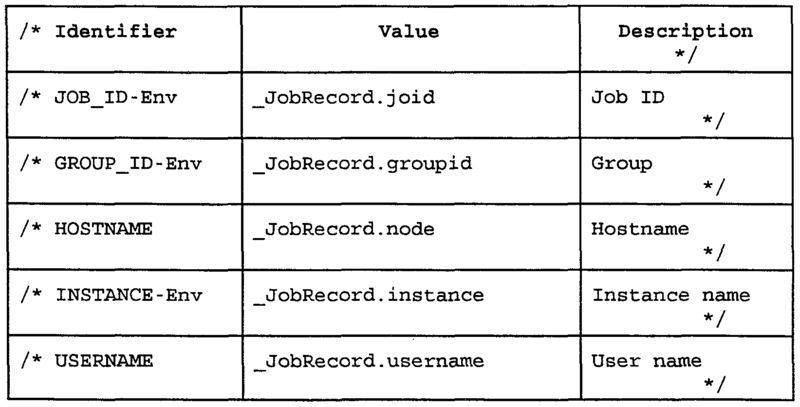 The method according to Claim 25, further comprising the step of recording each job and a history of each job in a job history repository. 28. The method according to Claim 27, further comprising the step of: utilizing a job data management device for, retrieving status messages regarding each job sent from a scheduling agent of a selected node of said job, and updating said job history repository based on said status messages. 29. The method according to Claim 28, further comprising the step of: maintaining a local job repositories, respectively on each of said nodes, each containing job and job history information for each job submitted to the respective node. 30. The method according to Claim 29, further comprising the step of: synchronizing said job history repository with each local job repository. 31. The method according to Claim 25, wherein said step of determining comprises the steps of: retrieving said job parameters from one of a product and a user interface that collects said job parameters; validating said job parameters; and allocating a job based on said job parameters. 32. 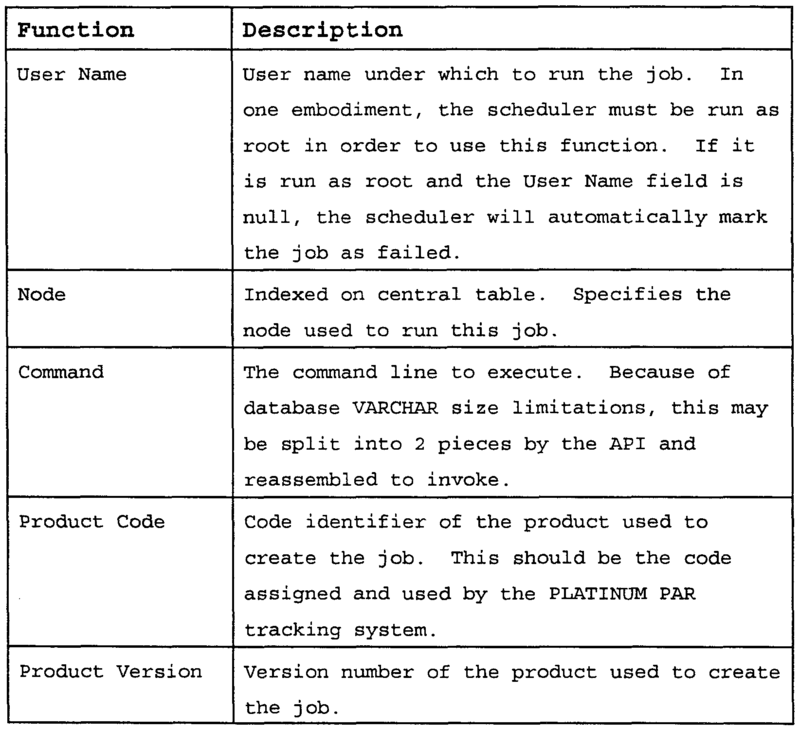 The method according to Claim 25, wherein said step of sending comprises the steps of: packaging said job parameters in a PEC communication format; and transmitting the packaged job parameters from a computing platform where said job parameters are determined to said scheduling agent maintain on the selected node. 33. The method according to Claim 25, wherein said step of executing comprises the steps of: setting up the selected node to run an application program identified by said job parameters; executing said application program on the selected node; and monitoring progress of said application being executed. 34. The method according to Claim 25, further comprising the steps of: accepting a command line for administration of jobs submitted to said enterprise scheduling agents; and communicating said command line to at least one of said enterprise scheduling agents for execution. 35. The method according to Claim 34, further comprising the steps of: substituting context variables in said command line with data based on said context variable and the job to be administered; and executing the command line. 36. The method according to Claim 25, further comprising the step of: communicating data, including at least one of job status, job logfile, setup, cancel, job parameter functions, and requests for said data between a product and each enterprise scheduling agent. 37. The method according to Claim 25, further comprising the steps of: registering each enterprise scheduling agent at a node address that identifies the registered enterprise scheduling agent with a unique datagroup; communicating jobs and job administration commands and requests with each enterprise scheduling agent via messages; and encoding each message sent to a recipient enterprise scheduling agent with at least one destination corresponding to a datagroup that directs said message to the recipient enterprise scheduling agent . 38. The method according to Claim 25, further comprising the steps of: retrieving autologin parameters from a user scheduling an autologin job; and launching execution of said job utilizing said autologin parameters . 39. The method according to Claim 38, further comprising the steps of: retrieving a notification script for a job being submitted; and executing the notification script on at least one of completion of said job and at a requested status point. 40. The method according to Claim 25, further comprising the steps of: accepting a scheduling calendar identifying at least on of execution times and intervals for at least one of said jobs; and executing said jobs on selected nodes at the times and intervals identified in the calendar. 41. The method according to Claim 25, further comprising the steps of: providing a description of at least one of said jobs, including a written description, a label, and an icon selected to represent said job; and identifying a time zone for display of job times. 42. The method according to Claim 25, further comprising the steps of: placing information about job times and status in an object containing folders, each folder identifying a categorization of jobs contained therein, including, an all jobs folder, a jobs by group folder, a jobs by node folder, a jobs by product folder, a jobs by type folder, and a jobs by user folder. 43. The method according to Claim 42, further comprising the step of: organizing said all jobs folder to maintain additional folders, including, at least one of, an all jobs any status folder listing jobs regardless of status and associated job history of each job, an all runs by status folder listing jobs according to status, including completed runs, failed runs, not started runs, preempted runs, running runs, and stopped runs, a held jobs folder listing jobs that are held and can be scheduled for a later time, and a scheduled jobs folder listing jobs that are scheduled to run. 44. The method according to Claim 25, further comprising the steps of providing a strategy scheduling window that allows a user to view, create, modify, and delete schedules for a strategy. 45. A computer readable media, having instructions stored thereon that, when loaded into a computer, cause the computer to perform the steps of: determining at least one job based on job parameters for at least one job to be scheduled; sending said at least one job to at least one scheduling agent maintained on a selected nodes of said computer platforms; and executing each job on the selected node under management of said scheduling agent. 46. 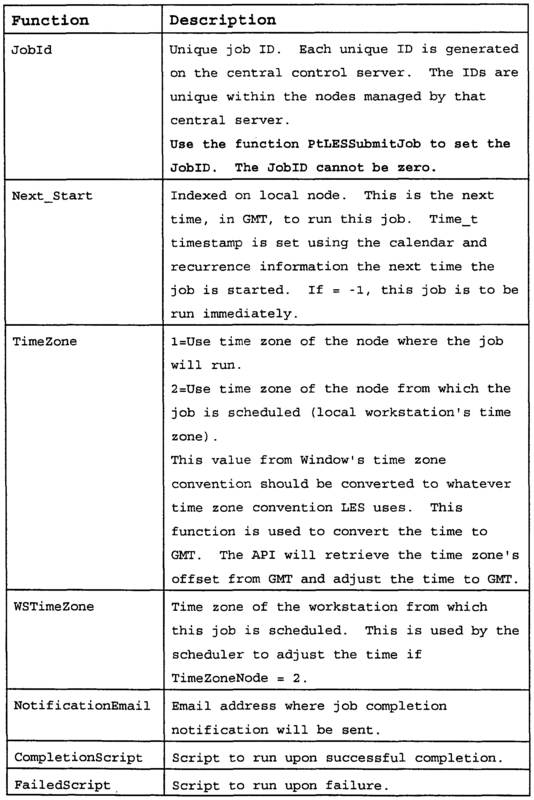 A job scheduling device for scheduling jobs to run on at least one node of at least one computing platform, comprising: enterprise scheduling means installed on each node and configured to launch execution of jobs submitted to the enterprise scheduling means; presentation means configured to accept and validate parameters identifying at least one job to be submitted for execution on at least one of said nodes; and job scheduler means configured to allocate at least one job based on said parameters and submit the allocated jobs to at least one enterprise scheduling means .